I had meant to follow-up on the topic of the invasive vine weed in my front yard, because, well, let’s face it…it’s a very exciting topic. Perhaps it’s worth mentioning because I had found the problem to be overwhelming at the time, and it turns out that I was actually able to get rid of a significant amount of it. As a result, the front yard is slightly passable at the moment, aided enormously by stuff being in bloom, but passable nonetheless. 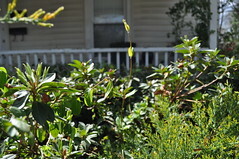 I’ll blog about the stuff that’s blooming later. This post is about the weed. 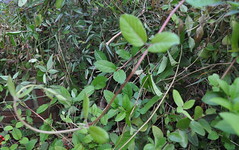 So I googled invasive vines, particularly along with azaleas, since my vines were basically smothering some of my azaleas (Or are they rhododendron? I forget. I went through the question of what exactly those plants are last year and don’t feel like revisiting it right now). 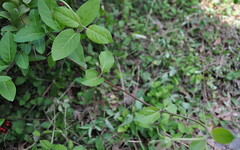 I looked at some photos, and I realized that what I’ve had for years has been Japanese honeysuckle. 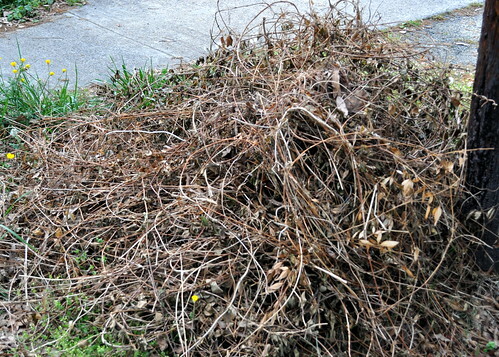 Over a few days, I spent some time just ripping it out wherever I found a vine. I must have made at least a hundred pulls. And I must have pulled out hundreds of feet of the stuff. At first, it seemed so overwhelming that I couldn’t imagine making much of a dent, let alone finding the source of any of it. But, eventually, I managed to clear out a good deal of it, and I went searching for the source, and I think I may have found one, the rhizoid, as it is known. So, I just wanted to document this for the benefit of any ignorant, beginner gardeners who also let stuff grown unfettered in their yards, and as a record of “before” in case I ever manage to get my yard in order. If I am optimistic, there are metaphors to be found here.